The Guild Church of St. Margaret Pattens in the City of London: Who was St. Margaret? Margaret of Antioch was a Christian virgin whose tortures and martyrdom became famous in early books of Acts. According to the legend, she was the daughter of a 3rd or 4th century pagan priest of Antioch who was either thrown out of the house by her father when she converted to Christianity or was converted by her nursemaid. She was noticed by the local prefect who wanted to marry her, but she spurned him and vowed to keep her virginity for Christ. He turned her in to the Roman authorities to be persecuted. 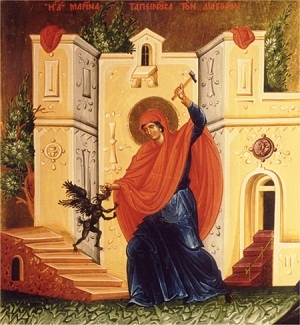 In prison she was swallowed by Satan in the form of a dragon, but the cross she was carrying irritated his throat, and he spat her out unharmed. Her persecutors tried to kill her by fire and by drowning, but each time she survived, converting the growing crowd of onlookers. Finally, she was beheaded, along with her many converts, by Emperor Diocletian (245-313 A.D.). She was buried at Antioch, but her remains were taken later to Italy where they were divided between shrines in Montefiascone and Venice. With the paving of the streets, the trade died out and it is thought that the last working pattenmaker died in the 19th century. 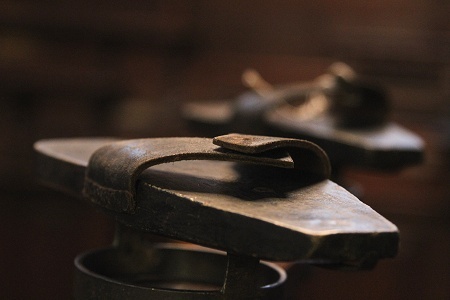 However, a pattenmaker was still listed in a trade reference in the 1920s. 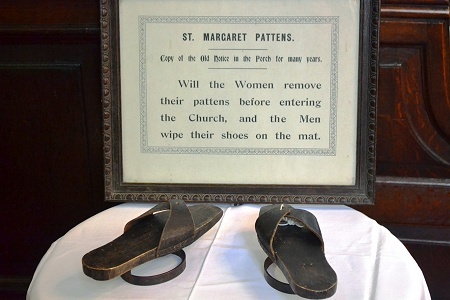 A notice in the church still “requests women to leave their Pattens before entering”. An alternative theory is that the name commemorates a benefactor, possibly one Ranulf Patin, a canon at St Paul's Cathedral during the mediaeval period.